The family of a former soldier who died after his benefits were cut, has called for an inquiry into how welfare sanctions are imposed. Diabetic David Clapson, 59, from Stevenage, died from lack of insulin, 18 days after his Jobseeker's Allowance was suspended in July. 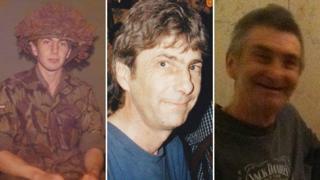 His sister, Gill Thompson, said more than 177,000 people had signed a petition backing the family's calls. The Department for Work and Pensions (DWP) said Mr Clapson had not appealed. On 2 July, Mr Clapson's £71.70 a week allowance was stopped for a month, after he missed an appointment with the Government's Work Programme (GWP) in May. Ms Thompson said he was found dead in his flat on 20 July, with £3.44 in his bank account. She added his electricity card had no credit, meaning the fridge where his insulin was kept chilled, was not working. She said she had started the petition, asking for an independent inquiry into the benefit sanctions regime as "vulnerable people won't speak up". "I know procedures have to be followed but I think they should look at how they follow those procedures....we're not all scroungers," she said. "All I want is for no one else to die like that, we are meant to be a civilised country." Ms Thompson, who lives in London, said the response to her brother's story had been "amazing" and she was currently taking advice on her next move. The DWP said decisions on sanctions were not "taken lightly" and people could appeal. "There is a chain of processes we follow before a sanction comes into effect, including taking every opportunity to contact the claimant several times," a statement said. "Mr Clapson did not appeal or ask for a reconsideration of the sanction or apply for a hardship payment."